Short-chain fructo-oligosaccharides are obtained from sugar beet, by means of an enzyme produced by Aspergillus niger, a microscopic fungus widely used in the food industry. 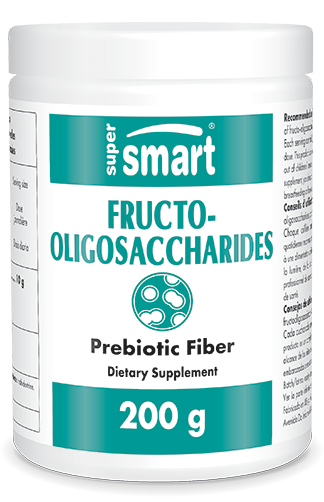 The effects of short-chain oligosaccharides have been demonstrated in over 150 scientific and medical studies, which have investigated the effects of daily consumption of 2.5 g.
¤ Fructo-oligosaccharides selectively nourish the bifidobacteria that benefit intestinal flora. A notable positive effect on the proliferation of these bacteria was observed at a dose of 2.5 g fructo-oligosaccharides a day, an effect which increased with doses up to 10 g a day. The bifidogenic effect is apparent after only four days of taking fructo-oligosaccharides. - 10 g a day boosts magnesium and calcium absorption ; several studies have shown that it increases the absorption of isoflavones in food and improves bone mineral density. - modulate important cellular events in order to prevent cancer. With a very similar structure to that of saccharose, fructo-oligosaccharides has the same sweet taste and texture. Their sweetening ability is around a third of that of saccharose but they have only 2 calories per gram, half that of sugar. Each spoon contains 5 g of Actilight®. Actilight® - Syral, France. Adults. Use between 1/2 to 2 spoonfuls (2.5 g to 10 g) of fructo-oligosaccharides a day to sweeten food and drinks.